An octopus tentacle can perform tasks as complex as opening a jar and can continue to function after being severed from its body, thanks to a concentration of neurons in the tentacle itself. 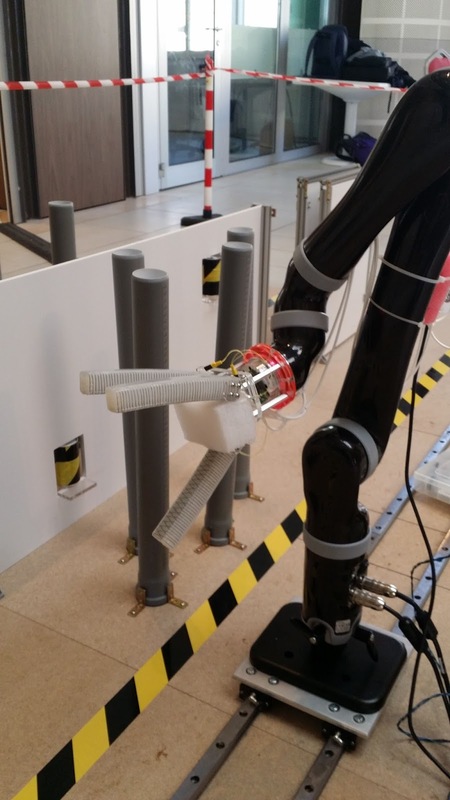 A team of researchers at the University of Colorado Boulder has created a robotic hand that is nearly as dexterous and self-contained, winning them the RoboSoft Grand Challenge manipulation competition in Livorno, Italy, on April 29-30. The “soft” robotic hand created in the Department of Computer Science’s Correll Lab uses a standard USB connection to provide control signals and power. A mini-pump supplies air pressure to inflatable fingers, while embedded sensors enable the fingers to make adjustments on the fly. In addition, embedded computation is used to detect whether a grasp is successful, an important capability for future robotic autonomy. “This demonstration is just the tip of the iceberg,” said Assistant Professor Nikolaus Correll, who created the robot along with PhD students Nicholas Farrow and Yang Li. “It lets us better understand the role of soft and stiff materials during a complex manipulation task.” He added that the lab is continuing its research into materials that can quickly change between stiff and soft – something his students recently used to make a skateboard that can be rolled up and stored in a backpack. The RoboSoft competition – announced in Nature in February – challenged teams in the field of soft robotics to create robots that could reach around obstacles and manipulate “mystery objects” with weights up to 1 kg over a distance of 60 cm, with the robot itself being limited to a weight of 20 kg. The CU-Boulder team’s modular pneumatic hand, combined with one of the most lightweight and stiffest commercially available arms (Kinova Jaco), weighed less than 7 kg and could reach up to 95 cm, with a payload capacity of 1 kg. The hand enabled delicate manipulation of a wide variety of hard, soft and fragile objects. Correll explained that their design not only makes grasping irregular objects easier, it also enables grasping when object recognition is limited, since grasp planning does not need to be perfect as with conventional stiff robotic grippers. “Soft grippers with embedded feedback control bear the possibility of creating a new class of robotic systems that are lightweight, soft, and mobile while being highly deformable,” he said. Farrow, Li and Correll have described their hand design in a paper on arxiv.org. Their research has been supported by the National Science Foundation’s National Robot initiative via a collaborative grant to CU-Boulder, the Massachusetts Institute of Technology and Harvard University.